April 12, 2012 marks a hundred years since the Titanic sailed and sank, but people are still fascinated by its fateful story. About every 10 years a new movie comes out telling the tale or a documentary dredges up additional information about the event. 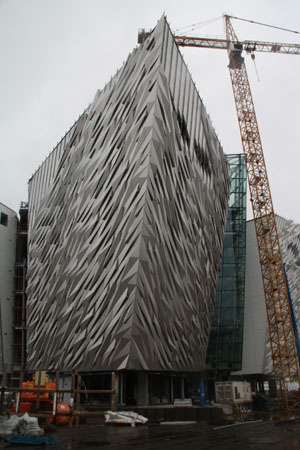 So it’s no surprise that a new museum will open in Belfast, Northern Ireland, city where the ship was built and launched, on the centennial anniversary of Titanic’s doomed voyage. To commemorate the importance of this historic event, as well as celebrate the city’s industrial and maritime heritage, the private TitanicFoundation Ltd. is completing a project of epic proportions—a $126.5 million complex set to open March 31, 2012. 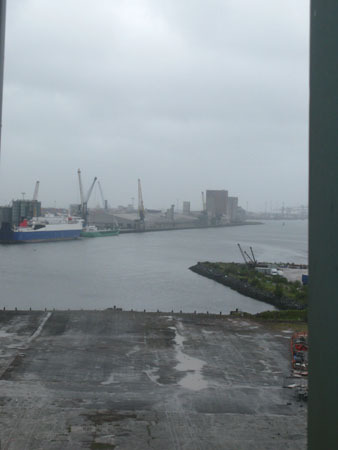 This project, which beganin May 2009, is expected to be Belfast’s premier tourist attraction. If you visit Ireland this year—or in the future—be sure to put the museum on your itinerary. During a visit last summer, I was privileged to see architectural drawings and take a hard- hat tour of the construction area located in the heart of the Titanic Quarter on the actual site where Harlan and Wolff Shipbuilders created the amazing ship. The iconic six-story silver building takes the shape of a ship’s bow, with the gleaming front resembling the Titanic as it stood in the boatyard. Nine galleries on four floors will take visitors through time beginning with Boomtown Belfast (shipbuilding was a big part of Belfast’s economy--at one time the hope of Belfast’s working class) up to present day video footage of the Titanic at rest at the bottom of the ocean. The museum is intended to be a destination where people linger as they hear stories of the ship, its design and construction, and the people who built it. One rusty wall of the building resembles the side of the ship, and blueprints on the wall will give visitors an exclusive look at building details. Using a variety of techniques including photographs, video, actors, computer generated images, authentic sounds, and an educational dark ride, Foundation engineers have designed the museum that allows visitors to feel they’re in the ship as it was being built. Stories of the 63-second launch, people traveling on theTitanic, and the sinking are told using interactive technologies, while audio from survivors provides poignant details of the event. Myths and legends are explained in an interactive true/false touch-screen format. A two and a half acre plaza around the ship forms a map of the world, enabling visitors to trace the planned route of the Titanic. A replica of the Grand Staircase on the stage of the Ocean Exploration Centre Banquet Hall, a facility that holds up to 1000 people for special events, provides a stunning visual showcasing the ship’s elegance.